Origins of the Earth, Moon, and Life: An Interdisciplinary Approach presents state-of-the-art knowledge that is based on theories, experiments, observations, calculations, and analytical data from five astro-sciences, astronomy, astrobiology, astrogeology, astrophysics, and cosmochemistry. 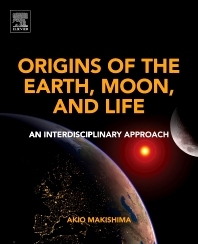 Beginning with the origin of elements, and moving on to cover the formation of the early Solar System, the giant impact model of the Earth and Moon, the oldest records of life, and the possibility of life on other planets in the Solar System, this interdisciplinary reference provides a complex understanding of the planets and the formation of life. Synthesizing concepts from all branches of astro-sciences into one, the book is a valuable reference for researchers in astrogeology, astrophysics, cosmochemistry, astrobiology, astronomy, and other space science fields, helping users better understand the intersection of these sciences. Chapter 4. What Is the Late Veneer, and Why Is It Necessary? Chapter 7. Life on Mars From the Martian Meteorite? 7.5. Life in the Martian Meteorite Was a Big Mistake! 8.4. Is the Apex Chert, From the Pilbara Area, Western Australia, the Oldest Microfossils? Chapter 9. How Did Initial Life-Related Molecules Appear on Earth? Akio Makishima is a Professor for the Institute for Planetary Materials at Okayama University. He obtained his Ph.D. from Tokyo University under supervision of Professor Akimasa Masuda. After three years in the Analytical Research Center of Nippon Steel Co. Ltd, he was appointed assistant professor and finally obtained professorship. His research interests deal primarily with planetary science and geochemistry. He has authored over 60 scientific publications and two books.